If you mean the one with white contrast stitching, it's 98000080.
scooby and anaplian like this. Is that the white gold edition with red gold hands on black dial?! thanks! now to see if i can find one to buy anywhere. marzen, CDavis7M, fmracer and 4 others like this. What an awesome thread! So many wonderful pics of all the beautiful variations on these models. I think the above pic on a NATO is my favorite - the strap is a bit unexpected/incongruous with such an elegant timepiece, but the AT's lugs really shine with any strap (much as I love the bracelets) and this wearer really pulls it off with the clothing/complete picture. Nicely done, sir. I am lucky enough to own several of these watches (I sold off pretty much everything else and replaced them with a full-on Omega herd); alas, I had many pics but just lost both my desktop HDD and its backup external-ugh. I'm in the process of exploring data recovery options and will post soon if I can recover my images (or, I'll just need to shoot some new ones). One thing that would be very instructive for us all is if the photo posters could mention the case size of their watches - I find the size really has an affect on the visual appeal of the watch. Having medium-to-large wrists, I went with the 41.5mm AT and Railmaster; the 39s looked too small on me (ditto when I tried the new Rolex Explorer; I had always coveted one since the standard 36mm was always too tiny, but the 39 wasn't quite enough either). However, judging the watches purely on their own (not a wrist shot), I typically find myself liking the 39mm or even 36s better; the balance of the dials just seems better. This is mostly with the small indices of the AT imo (I have the old smooth black dial, not the teak); the 41mm Railmaster seems to fare better with the larger numerals, and the I also own the old 2512 AT Chrono (steel/black dial) which wears smaller than 41-42mm imo due to the subdials and thicker case. In any case, thanks to all for the great pics - please keep this thread alive. It was love at first sight for me with the initial introduction of the AT; fortunately my wife heard my heart beating and bought me my first soon thereafter for my 40th Bday. 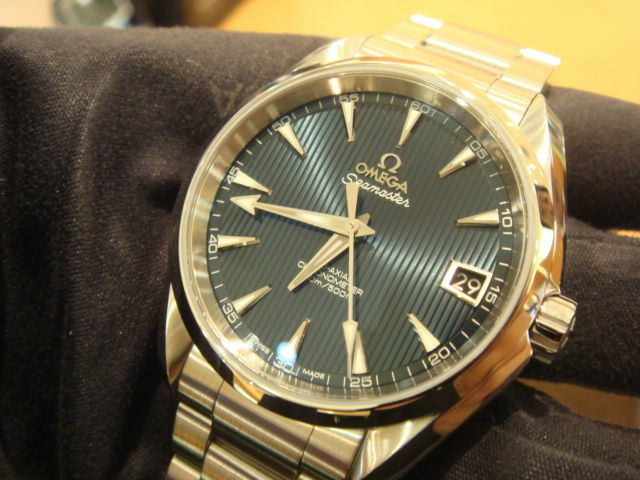 I recall some folks shuddering at a departure in Omega styling, and some saying it was a shameless marketing knock off of the Rolex Datejust. 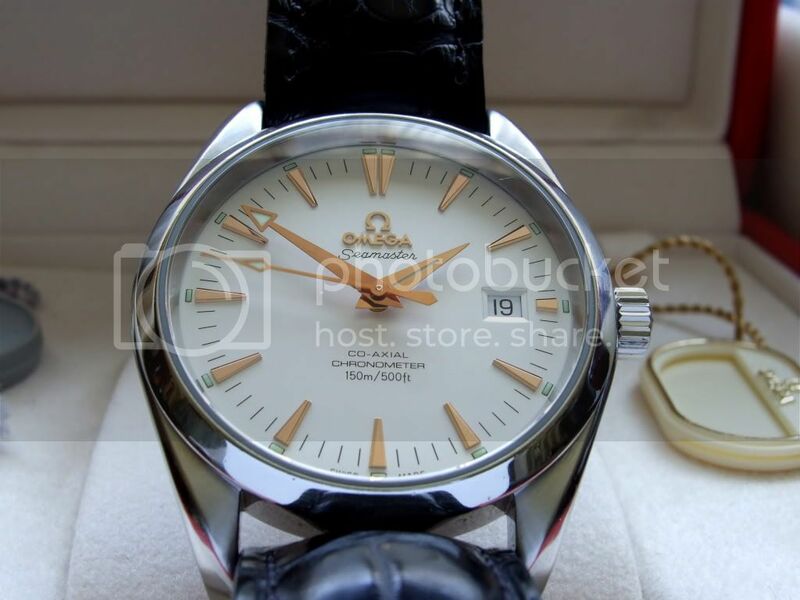 As these photos show, depending upon the straps used, these watches have plenty of their own unique style, with pure Omega heritage in the lugs; and each really shows the personality and individuality of their owner. I think that's a gorgeous shot! This was one of the variations I really wanted, as it would play nicely with silver or gold jewelry (I own very little gold but having no gold watches, it makes a bit of a clash when I do choose to wear any other gold pieces). The all new blue AT spotted at my local boutique.. Hands on and its beautiful! mitadoc, solesman and OMEGAFORCE like this. All three pictures are made with my Samsung Galaxy S2.